The Atlanta Braves had an unusually quiet off season. A few changes, expected trades, the loss of a few free agents, some players non-tendered and the required names floating about in the rumor mill. All in all, mostly quiet. The Braves entered camp with the starting line-up in place. But then something happened. Andrelton Simmons. Tyler Pastornicky was unofficially crowned the Braves new shortstop when the Braves let Alex Gonzalez go via free agency. There's been a big buzz about him. Not as big as that of Freddie Freeman or Jason Heyward, but still a pretty good one. I'm always a bit skeptical about the media and fans "crowning" a young player before they prove themselves. Expectations get set too high and it's not good for anyone, players and fans alike. Don't get me wrong. I'm excited about Tyler Pastornicky but Andrelton Simmons is challenging Tyler like no one expected. This is our Spring Training drama! A quick side by side comparison (as of noon today) looks like this. Pastornicky has hit in 22 games and has a .222 average. Simmons has played in 14 games and has a .186 average. Keep in mind that Pastornicky has had 20 more at-bats than Simmons. Neither average is stellar, but remember that Alex Gonzalez ended the season with .241 average. All in all, their batting stats are as comparable as their ages. Both players are 22 with only 4 months separating them. In the infield the story is a bit different. Simmons is markedly better defensively. Alex Gonzalez spoiled us last year with some brilliant fielding and Braves fans have gotten use to that. That makes a strong case for Simmons getting the call. But Simmons has only played as high as Class A ball. Is that too big a jump for a player? Not always, Rafael Furcal made the same jump but he also brought with him exceptional speed on the base paths. This is what must be considered. Simmons has only hit Class A pitching. There's a HUGE difference hitting at the major league level. Pastornicky has faced much better pitching in Gwinnett and Mississippi for a much longer time. That could give him the edge. It's been said that Pastornicky was only to be the Braves shortstop until Simmons was ready. Who knows how long that may be? Either way, this is a great "problem" for the Braves to have. Tommy Hanson has been named the Braves Opening Day starter versus the Mets. Jair Jurrjens will start the Home Opener versus the Brewers. Brian McCann has changed masks. He was forced to wear the hockey-style mask when he had his vision problems a few years ago but he never really liked it. He now is wearing a lighter version of that mask which he says he can see better out of. Why do you find it necessary to ruin one of baseball's finest traditions? Baseball's Opening Day is one of the Rites of Spring. Yet, you went and packed it up and sent overseas. And to make matters worse, no one in the United States could watch it. What the hay are you thinking!?! For 70+ years, Opening Day was a Monday. Every year, the very first pitch of the very first game was thrown just after the noon hour in Cincinnati. The Reds always started our season. It was tradition. Baseball's tradition. A few years ago you mixed it up a bit. The first game was played on a Sunday night. It was a nationally televised game that featured a team with something significant going on. Something like a bright, shiny new ballpark. Those two teams were then off on Monday when all the other teams played their first game. This year, the game was played today, March 28th...in Japan. The Mariners and A's faced each other in a game that started at 6am Eastern Time. And it wasn't televised. Not even by the MLB Network. Opening Day in the U.S. will be the night of April 4th with the Cardinals facing the Marlins in their bright, shiny new ballpark. Then there are six games on April 5th and nine games on April 6th. It will take 10 days to have "Opening Day". As Phil Dunfey would say, "Bud, why the face!?!" Or, as I will say, "Bud, quit screwing up one of our finest sporting traditions." His face and smile are still boyish, his heart is still young and his passion for the game is still there. But his body is aging and his knees have betrayed him. Today Chipper Jones announced that the 2012 season will be his last. As Braves fans, we've been spoiled for 18 wonderful years. We've had a front row seat watching the genesis of a Hall of Fame career. Chipper holds so many records. Braves records and MLB records. But for me the biggest and most wonderful record of all is that for 18 years, Chipper Jones has worn only one uniform. An Atlanta Braves uniform. No other active player has played for one team as long. Yes, we have been spoiled beyond belief. When Bobby Cox drafted Chipper in 1990 he saw something in him. He saw something that he didn't see in Todd Van Poppel. Confidence. It was something small, not the confidence, but a simple difference he noticed between the two young players. Chipper Jones made eye contact when speaking to him. Todd Van Poppel didn't. It almost seemed as if Van Poppel was avoiding the eyes of the Braves GM. Bobby Cox knows talent and all the things that make up a great baseball player. He saw it all in Chipper Jones. Chipper should have been the National League's Rookie of the Year in 1995. I still can't get past the fact that Hideo Nomo was given that honor. A pitcher who had played professional ball for 5 seasons in Japan was named "Rookie" of the Year. No, I'll never get over than one. But Chipper got what he really wanted that year. A World Series Ring. What a season it was for the future face of the franchise. And what a year that was for all of us! Chipper is the last piece of that team still in uniform as a player. He's the final link to that team of destiny. I knew the announcement was inevitable, but I hoped for the impossible. I hoped that he'd be able to play forever. At the beginning of Spring Training Chipper felt great. He was having a great time and if things went well, maybe he'd play in 2013 too. But the knees started barking and he needed to sit. The conversations that he'd had with John Schuerholz and Frank Wren over the past few seasons were becoming more real. It was time. Chipper made the announcement this morning and he did it as he wanted to. On his terms. He didn't want it to end as it did for Tom Glavine and John Smoltz. He always swore that he'd never stick around for the numbers or the money. He has too much respect for the game to do that. As always, Chipper Jones is true to his words. The press conference was perfect. Chipper was Chipper. He was forthright and as emotional as we've ever see him. He thanked everyone who got him to where he is today. His parents, his wife and children, his lifelong friend and agent, his coaches (from Little League to the majors) and his teammates. His teammates. That was the toughest for him. We don't decide what our legacy in life is. Others decide for us. But what I love most about what Chipper said was regarding his legacy and what he hopes it will be. He hopes to be remembered for being a good leader and mentor. He spoke of his Braves mentors, Terry Pendleton, David Justice and Fred McGriff and what they taught him. He said that if a player remembers just one "nugget" that he's been told, whether it's about hitting, about doing what's best for the team, about being professional or how to lead, then he's done what he always hoped to do. Baseball fans all over the country have the opportunity to see Chipper Jones for one more season and to thank him. It should be fun to watch...especially in Philly and New York. I think even the most loyal Mets fan has to be a little sad at retiring the "Larry" chant. If you'd like to listen to the press conference, here is a link to the audio, courtesy of 680 The Fan. Here are few odds and ends that I've picked up listening to and watching Spring Training games. Chipper Jones is not fat and has actually come in seven pounds lighter this spring. In addition, Chipper said that he was joking when he made the comment that he didn't know if he'd make it through the season with his bad knees. Chipper added that the two reporters weren't familiar with his sense of humor. At this point, shouldn't these sportswriters be use to Chipper's self-deprecating sense of humor? Brian McCann is changing his in-season workout regimen. He wants to do everything he can in order to avoid a late season slump this year. Brian, being his own toughest critic, has put too much burden on himself for the way last season ended. Tim Hudson has thrown two good bullpen sessions, both being pain free. He expects to throw his first batting practice session sometime this week. Hopefully Huddy will be in the rotation in early May! Jason Heyward lost ~20 pounds in the off season. He cut back on his weight lifting regimen. Jason noted that he's always had a lean body type and he feels that he's moving much better with less bulk. Hopefully he's put last season in the rear view mirror. Former Braves pitcher Gene Garber has been working with both Peter Moylan and Kris Medlen in the off season. Both pitchers feel that Gene has helped them a great deal. In fact, Gene has worked with Peter for the past three off-seasons. Braves Trainer Jeff Porter spoke to the media for the first time since losing his wife Kathy in a tragic automobile accident on New Years Eve. He wanted to thank everyone for the outpouring of sympathy and support for he and his son David. They're taking it day by day and the support of their Braves family and Braves Nation is helping. Dan Uggla changed his Spring Training hitting approach. He wants to make sure that the first part of his 2012 season doesn't mirror that of his 2011 season. I think Dan looks great at the plate! And what seems to be the biggest story of all to me? It's the possible battle brewing at shortstop. Tyler Pastornicky and Andrelton Simmons. But I'll save this one for another post! I've been listening to quite a few Spring Training games on the radio and I'm in heaven watching the games now that the tv broadcasts have begun. One thing I've really enjoyed is hearing and seeing Dale Murphy as part of the broadcast team. Murph has always taken part in monumental Braves celebrations over the years but it seems to me that he's been even more present over the past few years. Perhaps it's easier for him now that his kids are getting older. Last Wednesday, as the Braves faced the Nationals, Murphy threw out the first pitch. The catcher was his son Jake. 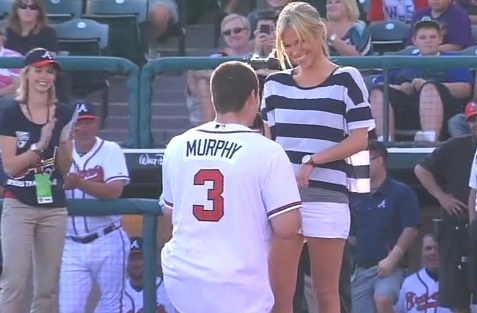 What happened next melted this baseball-loving-girl's heart! After Jake caught the ball, he called over to the stands for his girlfriend Arianne Ingersoll. He then dropped to one knee and asked her to marry him! Here's the part of the story that makes me giggle. Who is the incurable romantic who orchestrated this scenario? The one and only John Schuerholz. Who knew!?! The playoff system has been altered and I'm not happy. I didn't like the addition of the Wild Card back in '94 and now we have to deal with another one. There is an upside, but overall, I don't like it. First, and this is no shock, I'm a baseball traditionalist. I've always loved the fact that in baseball, fewer teams make the post season than in any of our other marquee sports. Only the best of the best make the playoffs in baseball and that's how it should be. But in the early '90's the Commissioner's office saw it differently. There was more money to be made by realigning, adding a division and then creating a playoff spot for a Wild Card team. I got it, but I didn't like it...especially when the Marlins won the World Series in 1997. The upside with the additional Wild Card spot is that winning the division means something again. Brian Cashman admitted that the Yankees coasted at the end of the 2010 season. They knew they'd get in the playoffs as the Wild Card so they rested players and "let" the Rays win the division. Cashman made the comment that the only difference between winning the AL East and the Wild Card is what the t-shirt says. Nice. I'm sure Mr. Selig loved hearing that. So now there's a one game playoff between the two Wild Card teams in each division. I guess they think it will re-create the excitement of the last day of the 2011 season. I disagree. Nights like September 27, 2011 come along once in a lifetime. They can't be fabricated. Managers Mike Scioscia of the Angels, Ozzy Guillen of the Marlins and Mike Matheny of the Cardinals like the new system. As for the players, some are good with it but from what I've read most don't care for it. They don't like the idea that the 5th best team in the division gets into the post season. Evan Longoria of the Rays and Chris Sale of the White Sox like it. The Davids (Wright and Ortiz) not so much. When it comes the Braves, there's a resounding thumbs-down. Some Braves players were ok with the second wildcard team in each division but they don't like the one game playoff. Brian McCann and David Ross aren't happy with it and Michael Bourne pointed out the obvious. Teams play 162 games and then it could all come down to one? "We don’t play a one-game series the whole year and now we’re going to play one game in the playoffs?" Chipper Jones doesn't like it. He believes that only the elite teams deserve to make the playoffs and it all boils down to money. "I know the almighty buck triggers everything, but when is enough enough? It makes no sense to me whatsoever – none whatsoever. One game is cutthroat. It’s win-or-go-home baseball, and players aren’t like that. You want to play yourself into getting to a cut-throat situation, like a Game 7. You’re going to have drama in a Game 7." Tim Hudson said that the format is probably good for the fans and MLB and he described the players as simply being "pawns". "You shouldn't get nothing for second or third." I know he's a Phillie but God I love that man! So what do all of you think about the new system? Yea or nay? I think Ryan Braun did himself a huge disservice when he went on the offensive at his No-50-Game-Suspension-Press-Conference and insinuated that his sample had been tampered with. He then questioned the ethics of the collector. Ryan, sit down, be quiet and be thankful that you get to play. And while all the hullabaloo of Ryan Braun's did-he-or-didn't-he stories were swirling around another name came up. Chipper Jones. Long career. Great numbers. Certain Hall of Famer. Did or he didn't he? There were articles written, an interview in the AJC and chatter all over local sports talk. I read and listened to all of it. It was very interesting and insightful. We all have our baseball heroes and we never, ever want to think or hear anything bad about them. These players are held to a higher standard, placed on a pedestal, and whether it's fair or not, we expect perfection. We often forget they are human. In Braves Country, the one we expect perfection from is Chipper Jones. We all know that Chipper is human. He's made mistakes both on and off the field. And he's always owned up to them. That makes me appreciate him all the more. Believe me, I've had my moments of being mad at Chipper. Maybe he didn't field a ball that I thought he should have. Perhaps he seemed to be swinging at every bad pitch that came his way. He has had lapses in judgement off the field. But Chipper has never pretended to be perfect and he's always faced the music...and the media. When I read Jeff Schultz' blog I smiled. Chipper was asked about the use of PEDs. He's a player of the steroid era. Yet when the Mitchell Report was released and names of possible offenders were bandied about, Chipper's name was never, ever mentioned. You can looks at the numbers. Many of those players who used PEDs had spikes in their numbers at an age where there shouldn't be any spikes. Chipper's numbers have ebbs and flows, but no unusual or unexplainable spikes. Chipper was honest in the article. Yes, he saw it. Yes, he thought about it. Yes, he knew of others doing it. But when he thought about actually using PEDs, he thought his family and THEIR future. Chipper thought about what it would do to his children, though none of his four sons were yet born. He also thought about the man who's heart he didn't want to break. His father. The one person Chipper never wanted disappoint or hurt was his dad. On Opening Day Chipper will take the field with 454 home runs and 2,615 hits under his belt. Most likely he wont reach two of the plateaus that many consider Hall of Fame musts. 500 home runs and 3,000 hits. Chipper wont reach those numbers because of injuries and his time on the DL. How many players did reach the gold standard because they used PEDs? That we'll never know. Braves fans know one thing for certain. The day Chipper Jones is inducted into the Baseball Hall of Fame will be a sunny day. A day with no clouds hanging over his head.